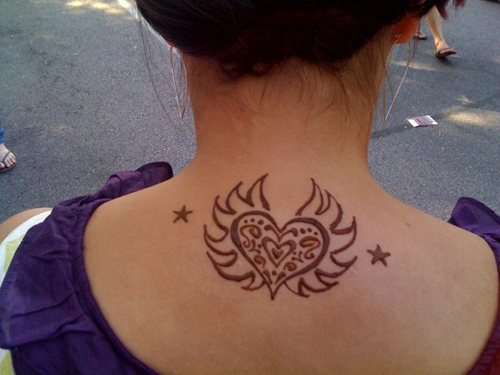 When I was at the Park Ave Festival I got a henna tattoo. This is the gooey stuff right after it was applied. I haven't blogged about it yet because once this stuff dried and came off you could barely see anything. It has only been the past couple days it darkened to look like it does below. And then it will start to fade... it's only temporary. Did you read that mom? It's only TEMPORARY! Don't freak out! Ooohh, pretty. How long is that supposed to last? i love henna! it's painless and it's just as nice (on the first few days :P) i did once on both hands and after a week, i looked like i've some kinda of skin disease! It's really lovely! A nice place for it, too. In Morocco if you get henna done by group of street vendor women they'll grab both your hands and once you're covered in henna goop you can't protect yourself from pickpockets. TRICKY! I imagine you didn't have to worry about that at Park Ave fest. 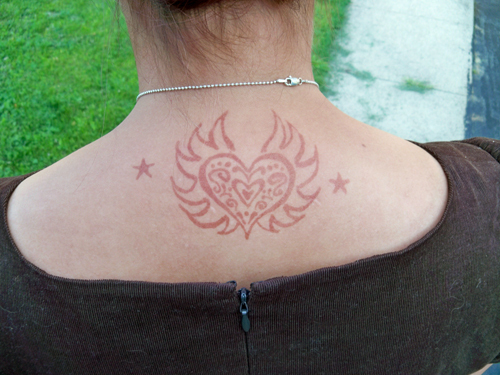 The skin on the back of your neck isn't very keratinous so it'll never be dark there. Lemon juice is good but add some sugar to make it stick. Just be careful of placement. Here in Good Ole NYC - ladies with lower back and upper neck area "tats" are referred to as "Tramp Stamps". NOT A REFERENCE TO YOU! If you got a real tattoo, the parents do freak out, but they get over it soon enough. You're an adult, after all.